Participants in an upcoming event at Milo McIver State Park will be on a quest to find a series of items while on horseback. The North Valley Chapter of Oregon Equestrian Trails will host a scavenger hunt from 9 a.m. to 3 p.m. Saturday, Aug. 25, along the park's equestrian trail. 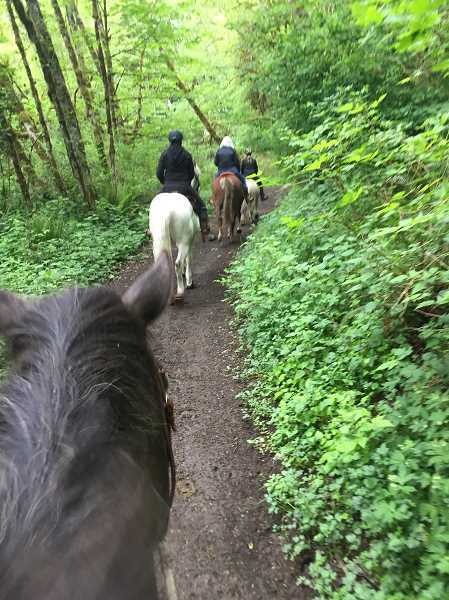 "It's a matter of finding things along the trail," said Rebecca Duren, who is organizing the hunt with fellow Oregon Equestrian Trails members Neila Whitney, Marty DeVall and Lindy Rutherford. Attendees will be given a list of clues that pertain to items they must find along the trail. Once they find the objects, they should take a photo of them. Most of the clues are listed in order of their appearance along the trail, and Duren noted that they are a mix of naturally occurring elements and items that have been placed in the park. "There are natural things, and some man-made things, but the man-made ones might not be that easy if they don't get the clue," she said. Those interested can complete the scavenger hunt alone or in groups of two or three. Entry fees are $10 for children younger than 12 and $20 for adults, and proceeds from the event will benefit Milo McIver State Park. Duren is excited for participants to decipher the hints during the big day and noted that one of the clues is "What a gymnast uses." Along with the objects described in the clues, there are also several "secret items" that will give participants bonus points if they happen to have them in the photos they've taken for the hunt. Duren estimated that the hunt will take around two hours to complete. "We're hoping it turns out to be fun," she said. "It's designed to be interactive for everybody." There will be an awards ceremony around 2:30 p.m., and prizes will be given to the three individuals or teams with the highest number of points. Water, lemonade and snacks will be available at the event. Additionally, those interested can purchase raffle tickets for $1 each. Duren said one of the best parts of the day will be "when they're out riding, and they figure out what something is." "It's going to be a hoot," she added. What: Oregon Equestrian Trails scavenger hunt on horseback. When: 9 a.m. to 3 p.m. Saturday, Aug. 25. Where: Milo McIver State Park, 24101 S. Entrance Road. Cost: $20 for adults and $10 for children younger than 12.